Handmade custom wedding invitations are a great way to stand out from the handful of other wedding invites your guests may receive this season. A few helpful tips and ideas for wedding invitations feature personalized, custom handmade and old-fashioned designs to wow your guests. It's easy to order wedding invitations. From the Internet to your local stationery store, it seems like so many places sell them. Unfortunately, they all seem to have the same designs as well. As fancy wedding invitations continue to rise in popularity, and people to have larger and more formal weddings, the selection of creative invites is becoming scarce. Whether it is silver embossed hearts, or two little kids painted in watercolor holding hands and talking about marrying their best friend, nothing is really original anymore. Any design that you find in one store can be found in another, and if you have a lot of friends and acquaintances that are engaged as well, what is going to stop you from possibly having the same invitation as them? The answer comes with the consideration of custom wedding invitations. These will allow you to be individual, unique, and expressive of your own special brand of creativity. You and your fiancée can allow your personalities to shine through without spending a bundle on pre-made invitations that you are only halfway thrilled with. Someone else who performs the work as a small business can make custom wedding invitations, or you can get more hands on and make them yourself for not a lot of money. Whichever method you choose, you can rest assured that you are taking a step in the right direction toward having a truly unique wedding that no one will be able to duplicate. On the Internet, you will find a lot of sites that will make custom wedding invitations for you. The site My Personal Artist (http://www.mypersonalartist.com) is a fantastic one. Through the Web you will be able to find a vast array and assortment of artists and designers who can make your wedding invitation dreams come true. However, you can also easy pay a pretty penny for it. Many of these customized sites charge in the excess of $15.00 per invitation, and if you are inviting the national average of 250 wedding guests to your big day, then the cost can add up quickly. The advantage? If you can afford it or you are having a more intimate gathering, you will get the best quality around from these custom artists. These designers do this professionally and you will be amazed at the superb quality you receive. The invitations may take a little longer to reach you, but the care and time put into each piece of paper is easily noticed. You will love it! If you can't afford to spend a lot on custom handmade wedding invitations, but you still love the look of something not so run of the mill or common, then you can always embrace your internal artist and create your own. It may seem difficult at first, but fortunately nationwide craft chain stores like Michael's have begun to recognize the demand for this alternative and have made it very easy. Prepackaged custom invitation kits are available for a low price, which will allow you to print straight out of your own inkjet printer and add any embellishments that you wish. Charms, stickers, stamps, and ribbons are also available for purchase to add those finishing touches, making your invitations extra personalized and special. You should start out with some sort of fine paper, which can range in everything from white or colored cardstock, to specialized papers such as sheets with pressed rose petals, or those that are uniquely recycled and designed for invitation making. Going to browse at pre-made invitations at your local stationary store is not necessarily a bad idea if you need to gain some inspiration with your wording. The sample invitations there will give you a lot of variety to choose from, ranging in formality from the most casual to a wedding fit for a princess. 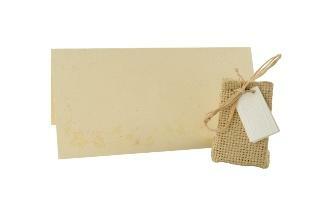 You can also find wedding invitation wording on Google or on wedding websites such as TheKnot.com. When making your invitations, remember to make the invitation readable above all else. Too many brides get carried away with twirly, swirly fonts that leave people confused as to where and when the wedding is. Make sure that your information is clear and concise. Simpleness can be just as elegant as fancy lettering and myriads of colors. Your guests will thank you. Whether you select store bought or custom handmade wedding invitations, make sure that they exude your joy and excitement toward your upcoming nuptials. The most important component of a successful wedding is a happy couple, and when you have that ingredient, the little details just seem to fall away and cease holding importance. Your wedding day will be one of the most special days of your life. And with custom handmade wedding invitations, you can help to make it all that you've ever dreamed!